SHANGHAI, June 27, 2018 /PRNewswire/ -- Vivo today revealed its Time of Flight (TOF) 3D Sensing Technology at MWC Shanghai 2018, with the promise of a paradigm shift in imaging, AR and human-machine interaction, which will elevate consumer lifestyles with new levels of immersion and smart capability. Vivo's pioneering TOF 3D Sensing Technology detects the time it takes emitted pulse light to return to the sensor to accurately map objects at up to three meters in front of it. It enables new opportunities in facial, gesture and motion recognition, 3D photography and AR, expanding the capabilities of the next generation of smart devices. 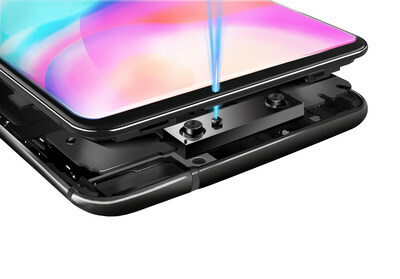 "From last year's debut of In-Display Fingerprint Scanning Technology, the recent launch of the truly bezel-less Vivo NEX, to our ground-breaking TOF 3D Sensing technology, we continue to forge ahead and evolve towards the truly intelligent future by opening new ways for the AI to help the consumer," said Alex Feng, Senior Vice President of Vivo. "By combining TOF 3D Sensing Technology with AI, we will continue to explore new possibilities for a better future." Vivo's TOF 3D Sensing Technology features industry-leading performance in depth of information captured with its 300,000 sensor points, which is 10 times the number of existing Structured Light Technology. This raises the bar by enabling 3D mapping at up to three meters from the phone while having a smaller baseline than Structured Light. TOF 3D Sensing Technology is also simpler and smaller in structure and allows for more flexibility when embedded in a smartphone. This will enable much broader application of this technology than was previously possible. Through precise and accurate tracking of gestures and movements of the user's entire body, TOF 3D Sensing Technology creates entirely new ways to interact with and experience the world. Using AI to beautify a photo according to the entire person is a whole step above current photography applications. Merging this technology with AR capabilities could take users one step further and allow them to try on clothes virtually with enhanced 3D virtual fitting. It can also track gestures for mixed reality (MR) games and provide an entire new way to immerse yourself in a virtual world through MR games. By combining AI recognition with TOF 3D Sensing Technology's precise understanding of what it sees, users can even capture entire objects using 3D modelling. Users can therefore scan and recreate entire objects digitally. This technology can be used to scan lesson props for education, or even help scan critical parts of the body for medical purposes. A global smartphone brand focused on introducing perfect sound quality and ultimate photography with cutting-edge technology, Vivo develops innovative and stylish products for consumers around the world. Vivo currently has several R&D centers worldwide, including the United States (San Diego), and China (Shenzhen, Dongguan, Nanjing, Hangzhou and Beijing). As an Official Sponsor of the FIFA World Cup™, Vivo believes in the importance of encouraging young people to embrace self-expression and an energetic lifestyle.